The Perold Vineyard which was planted in October 2008 is now bearing its first crop due for harvest in the next week or two. The crop will be small owing to the youth of the 1,000 Pinotage vines but it is hoped that one barrel of wine will be produced. I received news of the vineyard planting as I was finalising my book and it made an appropriate Epilogue because one of the books themes was the lack of public recognition Perold received. 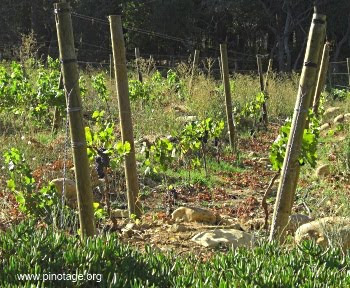 I had not seen the vineyard myself however, something I put right aided with directions from the ever helpful Pierre Loubser who has now retired as manager of the Pinotage Association. 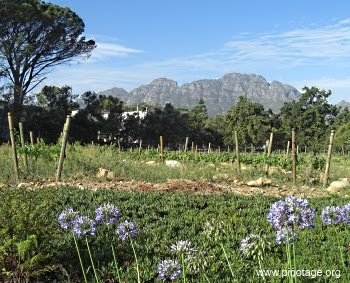 The vineyard occupies a triangular shaped piece of land at the junction of two roads in Stellenbosch, near the university, in thegrounds of a historical buidling called Mosterdrift. 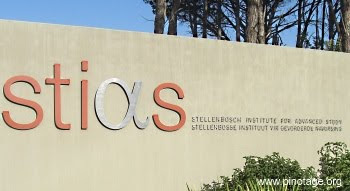 The land is owned by the Stellenbosch Institute for Advanced Study who are using the vineyard to research row positioning in relation to the sun. 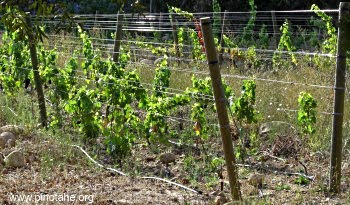 The vine rows are laid out like the ribs of a lady’s fan, radiating from a central point. 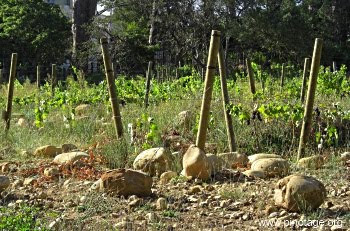 Inserting trellis poles and planting vines proved unexpectedly difficult as a considerable bed of large sandstone boulders were found just underneath the surface soil, and the photo’s show some that were uncovered. The vineyard is being farmed organically, indicated by the grass growing between rows. The vineyard is clearly visible from the street, from where my photographs were taken through a fence, on the corner between Marais and Jonkershoek. 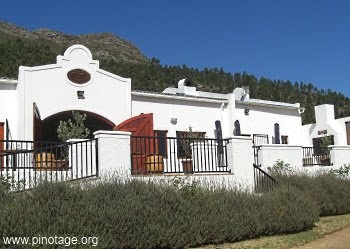 Freedom Hill is located south of Paarl on the R301 towards Franschhoek. I wanted to visit because I’d come across their name on the wrapper of Francois Naude’s 2009 Vin de Francois as supplying a barrel to that blend. Francois is a winemaker I greatly admire and he truly understands Pinotage and as he is making Pinotage for Freedom Hill then I really wanted to taste it. Freedom Hill is on a hill with a building above mature vineyards that slope down to the road. Heavy bunches of tight small black berries hanging from vines lined the access road. Wine is not made on the premises; grapes are taken to Stellenbosch Hills winery for processing. We were warmly greeted by Ryan Brendenkamp, co-owner of Freedom Hill restaurant, who showed us to the tasting room to another friendly welcome. From the veranda you can look back over the road to the Drakenstein Prison complex whose green roofs show above the trees. It was from here, when it was named Victor Verster Prison, that Nelson Mandela was released and took his first free steps. And that event inspired the name on the labels. It was a hot day, we’d waited 20 minutes at road works on the R301 so started our tasting with a crisp lively Sauvignon Blanc. The vineyards below grow four red cultivars: Shiraz, Cabernet Sauvignon, Merlot (which they sell) and Pinotage. I’d come for the latter. 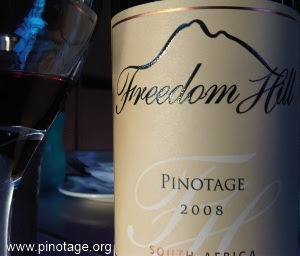 There were two Cape Blends, (2006 Freedom Hill 35% CS, 34% Ptage, 31% Shz & 2008 Freedom Walk 42% CS, 29% Ptage, 29% Shz)on offer and which I was keen to taste since I am looking for a Cape Blend to present at a tasting when I return home in a few weeks, and one Pinotage. Unfortunately all three reds were warm, tired, dull and lifeless. There were signs there once had been some rich fruit after one got past the flat beginning. Then I saw, after pouring, all three bottles being vigorously pumped with those so-called vacuum wine preservers (which have a reputation for flavour-scalping)and on asking learned that the bottles had been open for three days. The tasting room manager then did offer to open a new bottle but I’d lost heart. I bought a bottle of the Sauvignon Blanc and Pinotage which I opened the following evening after slightly chilling it. It was a different wine from the corpse in the tasting room. There were fresh chunky fruits and it was big, rather rough around the edges and rustic in style. Enjoyable, but not the elegant sophisticated complex masterpiece that is Francois Naude’s trademark and which I’d hoped for. Then I noted this was the 2008 vintage, the previous vintage to the one Francois had use a barrel of for Vin de Francois 2009. Loma Prieta Winery, a boutique winery in California's Santa Cruz Mountains mountains email to share the news that their Loma Prieta 'Amorosa Vineyard' 2009 Pinotage, has won a Gold medal at the US International Winemaker Challenge competition. Loma Prieta are sourcing fruit from Vino Con Brio's Amorosa Vineyard in Lodi while their own Pinotage plantings growto maturity.